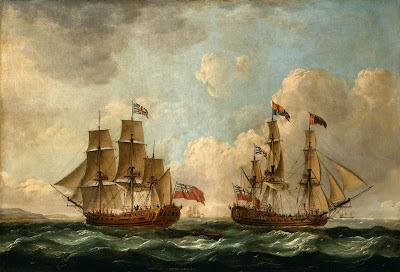 The Peregrine (later renamed The Royal Caroline) in Two Positions off the Coast, John Cleveley the Elder, 1766, The Berger Collection. The Peregrine was a doomed ship when Edward Knowles took command. 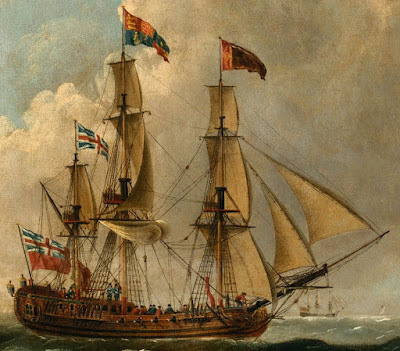 Launched in 1700, the Peregrine was renamed the Caroline when she was converted from a twenty gun sixth rate galley to a royal yacht in 1716. She later became the Royal Caroline before being refitted into a sixth rate once again, and restored to her original name. 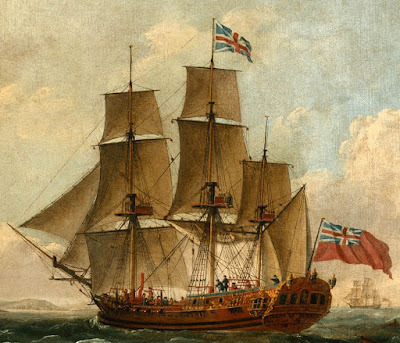 In her sixty first year of service, she was placed under the command of the seventeen year old Captain Edward Knowles. 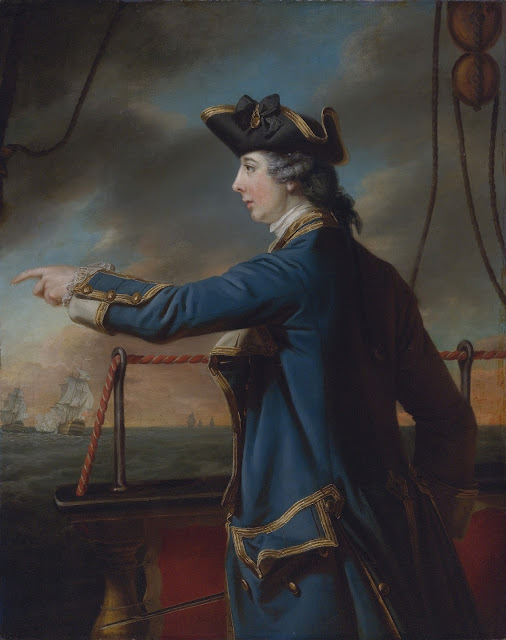 A remarkably young lieutenant in the Royal Navy, he could credit his quick rise through the ranks at least in part to his father, Sir Charles Knowles. A distinguished naval officer, Sir Charles has recently been promoted to full Admiral. 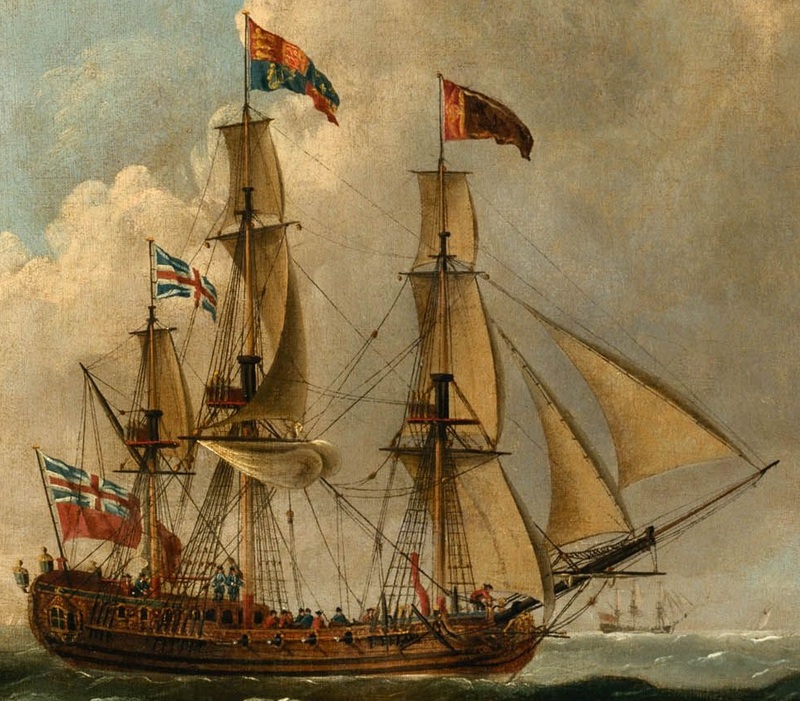 Edward was entrusted with carrying vital dispatches for Augustus Keppel at Belle Île and the naval squadron at Lisbon, informing the commanders that war had been declared with the Spanish late in the Seven Years War. It was late in the year, and after arriving at Belle Île Knowles was warned by Keppel not to put to sea with his aged and small vessel and an impending storm. Ignoring the advice, Knowles and the Peregrine were lost at sea with no survivors. Edward Knowles, Francis Cotes, c.1762, Wikimedia Commons. Sir Charles felt the loss of his eldest son keenly, and commissioned Francis Cotes to make a posthumous portrait of Edward based on a silhouette in Sir Charles' possession. Edward Knowles' image was preserved by Cotes, and in 1766, John Celveley the Elder chose to preserve the Peregrine and her crew. In this painting, Cotes portrays the Peregrine in two positions, and in two times. On the left, she flies the colors of a warship, and on the right, the colors of a royal yacht. Cleveley began his life as a joiner working the dockyards. While a marine artist like many others who focused primarily on the ships he was painting, Cleveley usually populates his scenes with people. Perhaps this was a bottom up view of his time, and a recognition that ships and officers alone do not make the navy. A ship is useless without her men. While Edward was remembered by his wealthy family who could afford a portrait, the legacy of Peregrine's crew were enshrined by Cleveley's depiction of their vessel. In both views, the crew are largely depicted aboard her in cocked hats with red and blue jackets.